Do you need to revamp your fence or deck? A perfect painting job can be the difference between a deck or fence with a rugged, aged look and one with an instant new look. We take the difficulty and hassle out of your painting job. 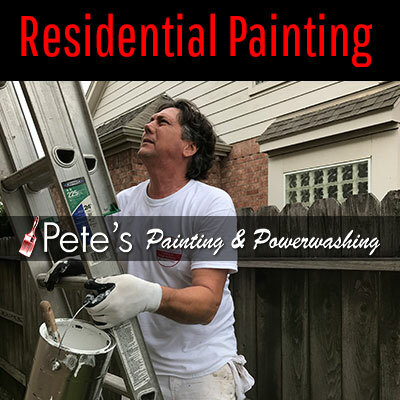 At Pete’s Professional Painting & Power Washing, we efficiently and promptly give your fence or deck a new look without leaving a mess behind, whether you want it painted or stained. With a good reputation for providing exceptional painting services, we cater for both residential and commercial clients. We have the tools and equipment needed to develop highly resistant floors. With the right cleaning tools and detergents, we are able to remove the toughest of stains and spills on your floor. Weathered decks are increasingly becoming popular. Various challenges might come up as a result of nails protruding on your deck. We can repaint your deck, giving it a new yet unique finishing touch, in addition to replacing worn out slats. Our company customizes cleaning to suit your surfaces, whether they are painted or not. What’s more, you need to retain the natural look of your home by cleaning it regularly. We can help you clean your home through pressure cleaning services. Choose deck furniture that blends well with your other interior decorations. Choose functional and decorative furniture such as chairs, ottomans and benches to furnish your deck. Add bold colors through cushions and other accessories for a glamorous look and personal touch. At Pete’s Professional Painting & Power Wash, we offer free price estimates on our residential services. Whether you want your deck/fence stained or painted, our professionals offer a free price estimate for your order. We also offer free price quotes on deck improvement, pressure cleaning or concrete cleaning.